Kombucha is a non dairy probiotic, microbiological food. 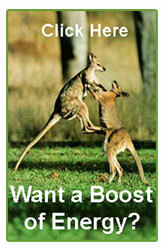 It helps regenerate the bowel flora and is excellent for wellbeing. What is Kombucha made of? 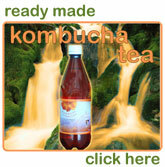 - Kombucha is a popular health promoting beverage and natural folk remedy made by fermenting tea. Kombucha is a colony or culture of yeast and other microorganisms embedded in a pure cellulose "pancake." When the "pancake" is grown in a blend of tea and sugar, it transforms the liquid into a refreshingly lightly sparkling, sweet and sour drink with a fruity fragrance full of health giving acids and nutrients. The Kombucha culture feeds on the sugar and, in exchange, produces other valuable substances which change into the drink: glucuronic acid, glucon acid, lactic acid, vitamins, amino acids, antibiotic substances, 0.5% to 1% alcohol is produced as well as other products that help balance the body's ph. Kombucha apparently evolved from plant organisms over 2.5 billion years ago. People have been preparing and making a fermented tea drink for over 2ooo years for many centuries. The fact that is still here today is a testimonial in itself and that millions of people throughout world for centuries have found it to have great value. The components of Kombucha - The principal yeast is Schizosaccharomyces Pombe; others varyingly include Saccharomyces Ludwigii, torula and apiculatus types, Pichia fermentans and Mycoderma. Principal bacteria are Acetobacteria xylinum, Gluconobacter bluconicum and Acetobacter xylinioides; others varyingly include Acetobacter aceti/ketogenum/ pasteurianum.